(TUCSON, Ariz.) – Library customers can pay overdue fines and help support the Community Food Bank of Southern Arizona during Food for Fines, April 15-30, 2019. During Food for Fines, $1 in overdue fines will be waived from a customer’s library account for each non-perishable food item donated at any Pima County Public Library location. What fines can be waived? Only overdue fines will be waived. No lost material, damaged fees, collection agency fees, or other fees will be waived during this event. 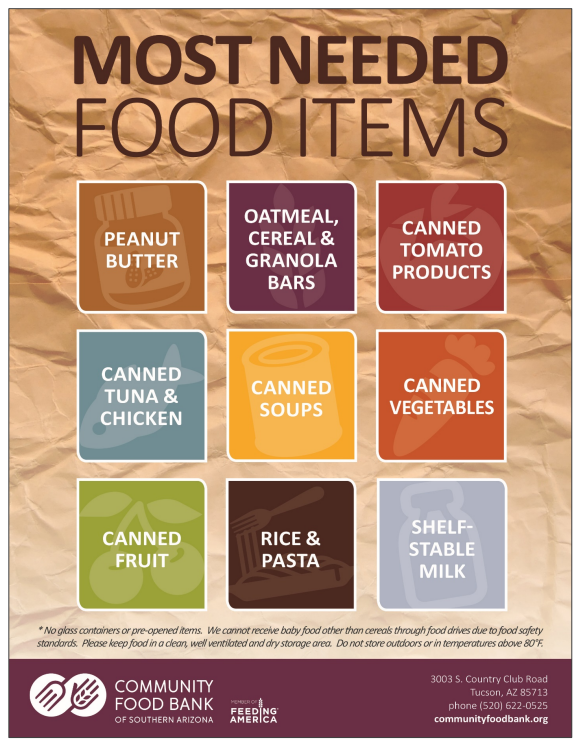 Nonperishable items such as canned vegetables, peanut butter, cans of tuna, and cereal are all welcome. 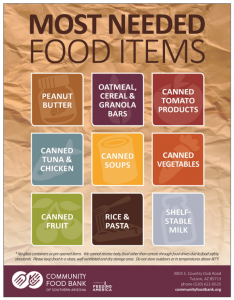 See a full list of the most-needed food items. All donations are sent to the Community Food Bank of Southern Arizona, so your donation goes directly to your community. What if I don’t have any fines on my account? If you don’t have any fines and still want to participate, that’s awesome! Your donation will be sent along with the rest of the food.